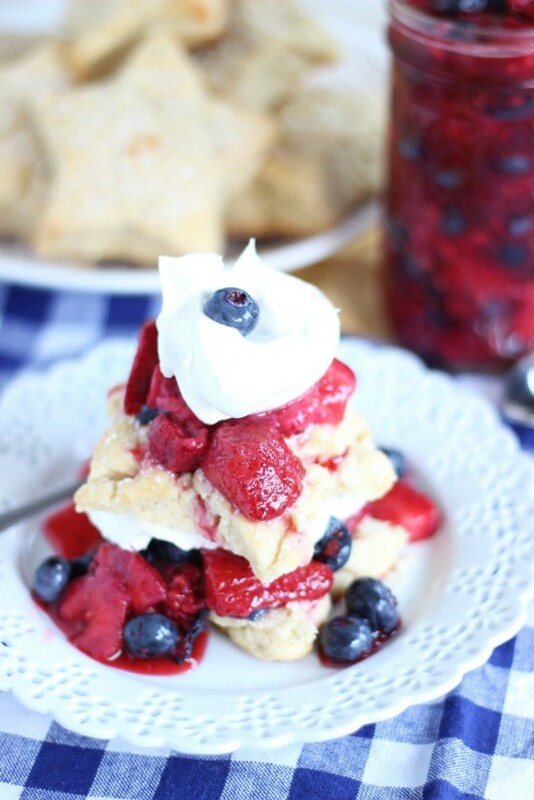 Mixed berry sauce, with whipped cream and tender, buttery shortcakes! 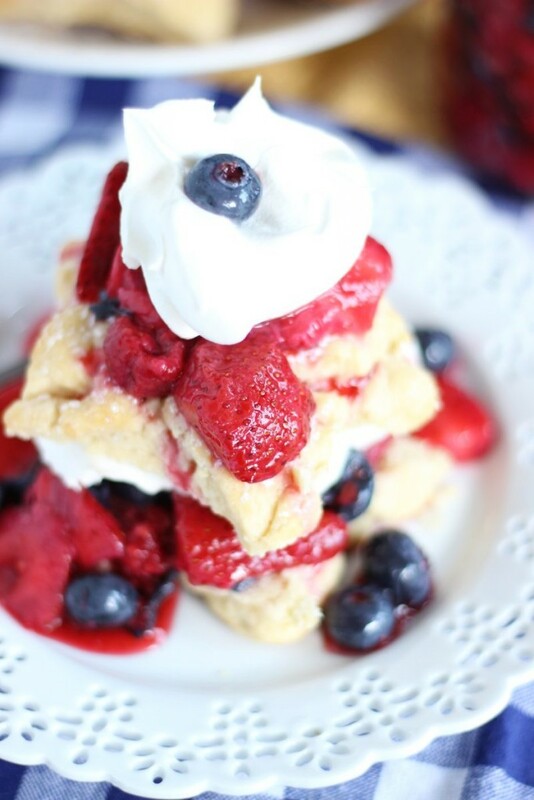 The quintessential summer and 4th of July dessert! 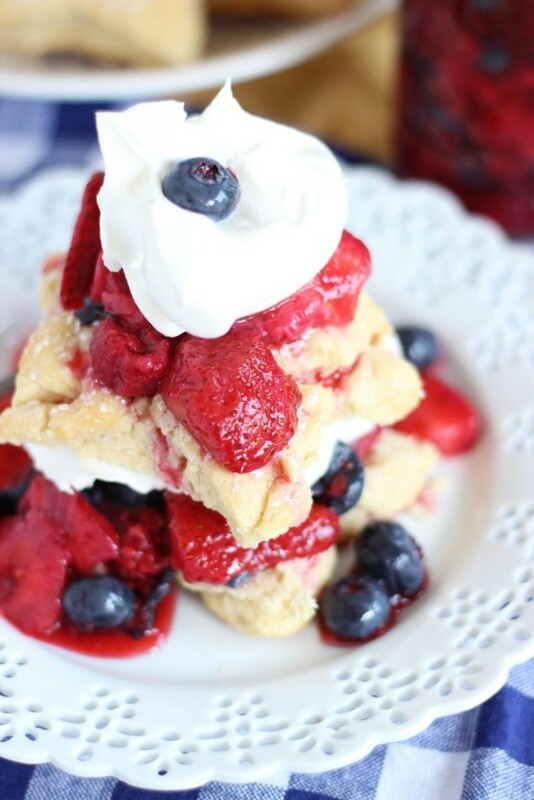 I’m on summer vacation this week, and what’s more summery than shortcakes? These are a summer dessert classic. THEE dessert of summer, in fact. I went to pick strawberries with my Mom and Gma yesterday, and we spent the afternoon making 4 batches of jam from about 16 quarts of strawberries. It was quite the process, and quite the assembly line! 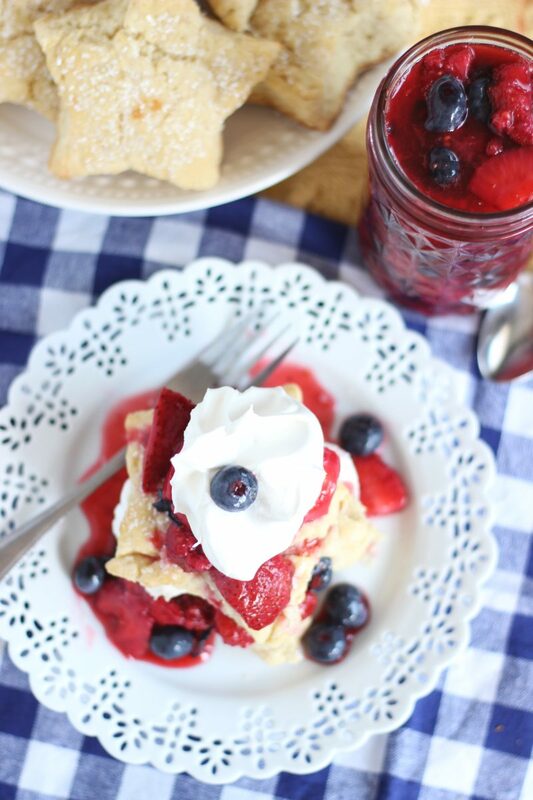 There’s probably no better time to share these Mixed Berry Shortcake Stars than when I’m staring down 20 jars of strawberry jam, am on summer vacation, and we’re a few days shy of the 4th of July. 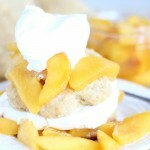 These shortcakes are adapted from one of my favorite cookbooks, and they are tried-and-true. I trust everything I make from that cookbook. 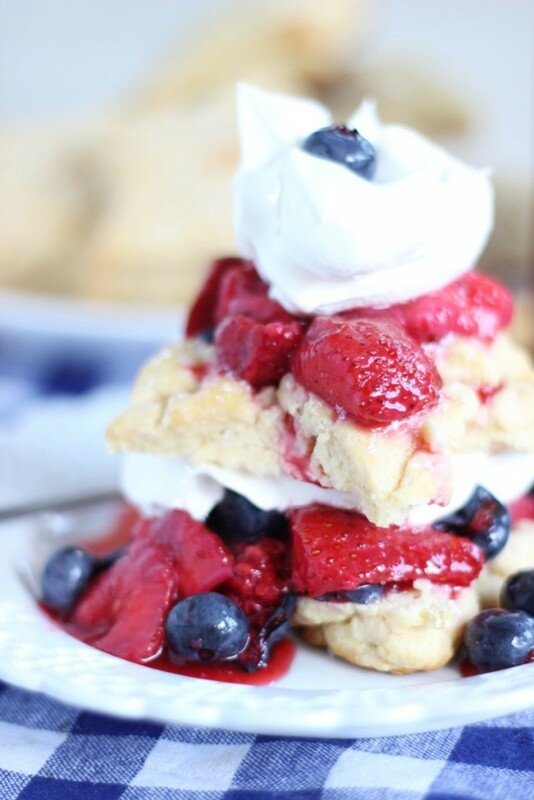 These shortcakes are buttery, flaky, and a little cake-like and sturdy for holding up to a pile of crushed, sweetened berries. 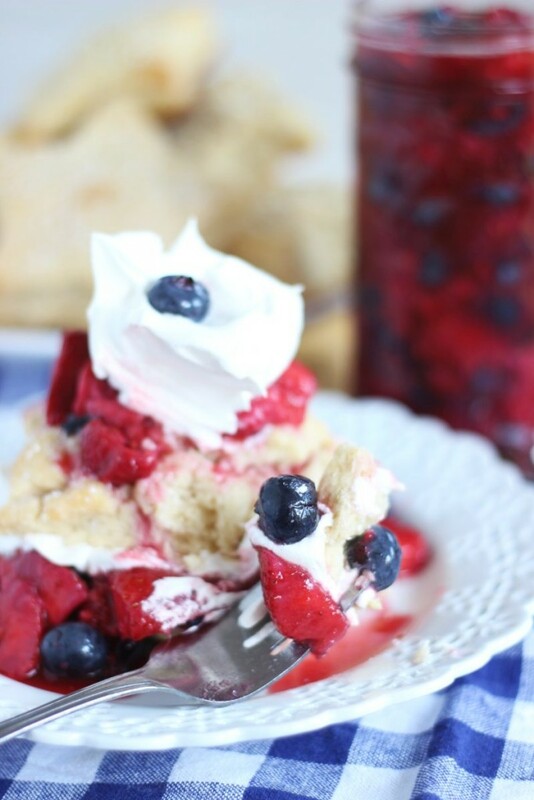 I mixed together blueberries and strawberries for a festive ‘red, white, and blue-themed’ version of shortcakes, and because I also just happen to love that combo of berries together. You don’t have to make your shortcakes star-shaped, but you why wouldn’t you? It’s fun and festive. 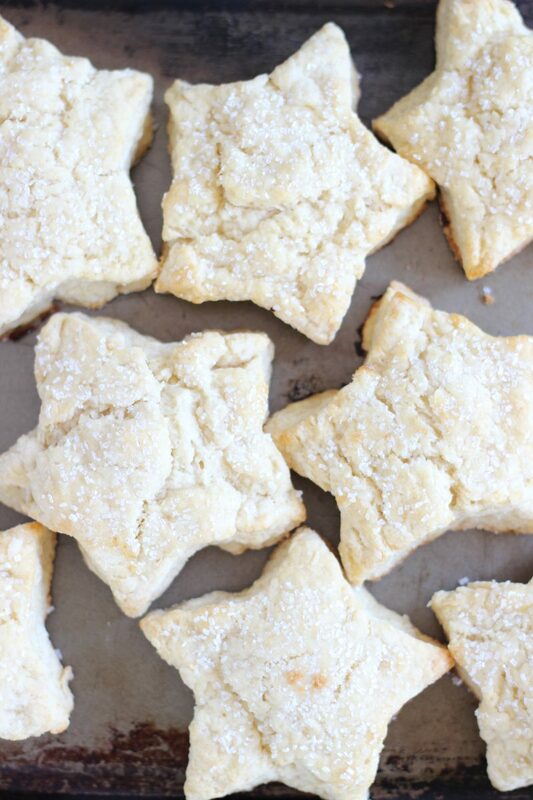 If you have a star cookie cutter on hand, it was a fun way to make these extra holiday-ish! With layers of flaky, tender shortcakes, whipped cream, and macerated berries, this from-scratch version of Mixed Berry Shortcakes will be a crowd-pleaser for your 4th of July picnics! 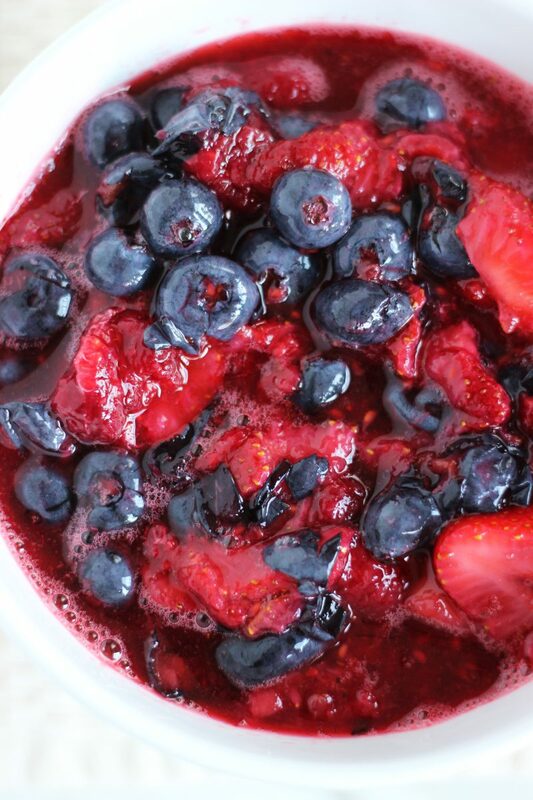 In a medium bowl, combine blueberries, strawberries, and 1/4 c. sugar, tossing to coat. Using a fork or potato masher, lightly mash the fruit. You want to leave some of the blueberries and strawberries in larger chunks, but you want some of the fruit crushed so that it absorbs the sugar. Set aside to macerate, and prepare shortcakes. In a large bowl, whisk together flour, 1/4 c. sugar, baking powder, and salt. Using a cheese grater, grate the butter into the flour mixture, and whisk or stir until the mixture resembles coarse crumbles. Alternatively, you could use a pastry blender or knife. In a small bowl, whisk together 1/2 c. cream and the egg. Add the egg mixture to the flour mixture, and stir until just combined. It should begin to form large clumps of dough. Turn the dough out onto a lightly floured surface, and knead gently until dough comes together in a ball, about 6-8 times. Do not overmix. Pat into a large disk, about 1-inch thick. Using a star-shaped cookie cutter or biscuit cutter, cut 6-8 biscuits. Arrange on the prepared baking sheet, about 2 inches apart. 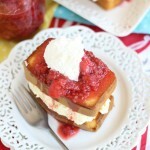 Brush with cream and sprinkle evenly with turbinado sugar. Bake at 425 degrees for 12-15 minutes, or until edges are golden brown. Transfer to a wire rack to cool, about 10 minutes. 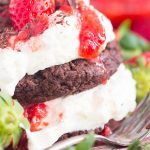 Split each biscuit in half and place bottoms on individual plates. 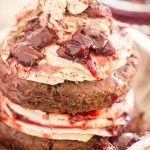 Spoon the mixed berry sauce over the biscuit bottom, top with a dollop of whipped cream, cap with biscuit top, more mixed berry sauce, and a final dollop of whipped cream. Shortcakes only adapted from Cook’s Illustrated. Wow, your jam-making session sounds productive! 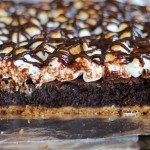 I love this delicious dessert recipe for the Fourth, too. Have a great holiday! 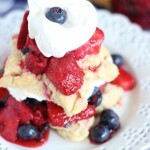 These shortcakes look stunning- such flaky pastry with delicious whipped cream and mixed berries? Yum.